Share ClickVerse.com and our Affordable Tutoring with others. 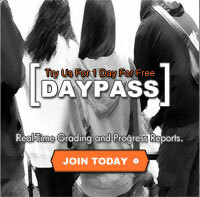 Any new member can use the Day Pass to sample our services. After one day it is only $3.99/month to continue. ClickVerse.com uses computer simulated study partners to help you learn, retain, and master the information most pertinent to your education and profession. Create study partners to target areas of study most relevant to you. Use all the study partner features to learn, retain, and master information as efficiently as possible. Review your performance with reports detailing your activity question-by-question for every study partner feature you engage in. With group plans you can share study partners and progress reports with your classmates, family members, co-workers, or employees. Use customizable and personalized study features whenever and wherever you have internet access. Since our process, methodology, and interface may be new to you, we highly recommend watching our basic introductory videos before you begin. Each study partner is equivalent to a live tutor except that it is computer generated. The purpose of our study partner format is to remove all irrelevant content and to teach you only the facts in the most efficient manner possible. This means minimal, if any, guessing and means not relying on the trial and error approach to learning. This email is a personal invitation from ClickVerse LLC. If you have any questions, email daypass@clickverse.com or call 1.702.910.4365. This is a product offering from ClickVerse.com, 4912 Vivaldi Dr, Las Vegas, NV 89146. �2015 ClickVerse LLC. All rights reserved.